BACK in the 80s, tomatoes were such a prized commodity and farmers in Bundaberg were making so much money, they were rumoured to be smoking $50 bills. While things are a little more sedate these days, the optimism and innovation that prevailed in this Southern Great Barrier Reef region continues to flourish. For a glimpse of the Bundaberg of old, drive down Bourbong Street and you'll find not a lot has changed. Those iconic, quintessential Queensland buildings still stand proudly like the shocking pink School of Arts; the stately Post Office and the Grand Hotel. From the air, Bundaberg is a patchwork quilt of volcanic rust, red soil and emerald green sugar cane punctuated by the slithering snake of the mighty Burnett River which winds to a turquoise Coral Sea. 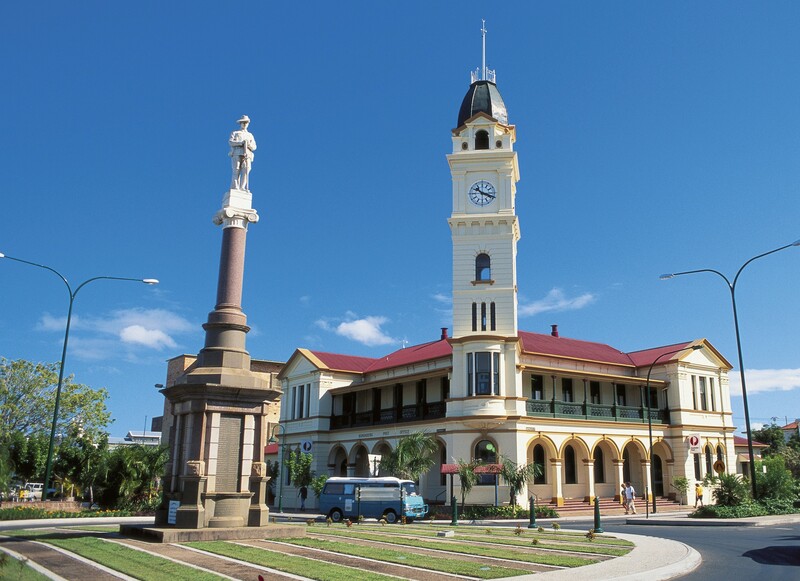 On the ground, Bundaberg boasts authenticity in spades. Start your journey in Childers, which lounges along a seductive red ridge which falls away to green valleys and cane country. Charming Childers has much about which to crow. The Paragon Theatre harks back to yesteryear with its canvas strung chairs and bouncy timber floors. There's good coffee served in retro seats at Espresso Coffee out the front. And bang next door, the delightfully-named Cane Fire Cheese House sells local produce. Wander up the main drag of this historic town and keep an eye on the ground, as this is where Childers keeps its street art in beautiful paved mosaics. Slip down a quiet lane and grab a coffee, Melbourne-style. Take your time and drive the Childers Wine Trail, there's old and new players here. Back in Bundaberg and down at one of its many beaches, it's all late afternoons sprinkled with shadows, sunshine and salty sea air. Beautiful Bargara speaks of soldier crabs and secrets, picnics and promises, rock pools and rumours and glorious gossip of what's new in town. In the CBD, sip on a Thirsty Turtle and marvel at Bargara Brewing's range of beers, or pop over to Kalki Moon Distilling Company out near the airport and see how gin is making an entrée into this rum city. These days you can even blend your own rum at the Bundaberg Rum Distillery. Sleep in a beautiful zen-inspired beach retreat, an elegant oceanfront apartment, a retro holiday park or motel, or flop and drop in a B&B on a winery. Elliot Island or luxury boat to Lady Musgrave Island, you'll adore snorkelling in our aqua lagoons and warm waters. Coral and creatures? They're here in all their glory. Back on terra firma, meet our colourful characters. From baristas to butchers to brewers, Bundaberg North Burnett encapsulates that old-fashioned country Queensland friendliness and sprinkles it with city innovation. As for food, we've got that in spades. Check out our cheeky café culture from art-deco inspired eateries to sassy French shops – the one thing they share in common is the food is all local. Wine and dine in Bundaberg North Burnett style. Whether its Hervey Bay half shell scallops you seek, or Biggenden pork, our restaurateurs draw on the finest, freshest produce of the region served in some of the most scenic settings around. Want to know more about our paddock to plate inspiration? Join a foodie tour and meet our earthy farmers at the grassroots. Despite generations on the land, even here they're diversifying to meet market expectations. Yes, this is a darling destination where charming farmers will pick sunflowers straight from their field for you, for free. It's the seductive scent of local butchers who employ old European methods of smoking meat and wine makers who still use corks. It's the zesty flavour of Bundaberg limes, plucked straight from the tree and transformed into lime-inspired beauty products. It's the mushroom producer diversifying into mushroom wine. Bundaberg North Burnett is burnt orange sunsets that scorch the night sky like cane fires as you sit along the Burnett River. It's the colour purple of lavender farms which sell gelato infused with this happy herb. It's balmy summer evenings at Mon Repos beach, salt in your hair and sand beneath your toes, waiting for Mother Nature to do her thing. That moment you pause and hold your breath when a turtle lays her eggs and that pure delight when several months later, the hatchlings emerge and instinctively make their way to the ocean. It's selfie spots and secrets you never knew existed. From street art spots to where to catch the best wave, and even spot a dingo or two, Bundaberg North Burnett is all that and more. At the Bundaberg Regional Art Gallery there's a cheeky purple sign which states: "Though provoking, risk entry". We reckon that sums up the Bundaberg North Burnett experience. Dare to be delighted. This blog was written by Christine Retschlag from The Global Goddess. Christine visited our beautiful region thanks to our incredible members and Bundaberg North Burnett Tourism.